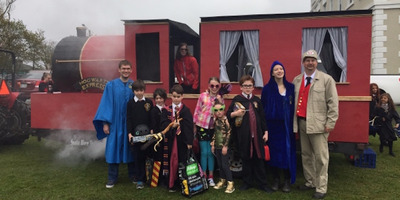 Laura Howells/CBC NLAll aboard the Hogwarts Express. For students at one Canadian school, Hogwarts comes to them. Since 2002, third grade students at St. Bonaventure’s College, a Catholic K-12 school in St. John’s, Newfoundland and Labrador, Canada, have had the chance to experience Hogwarts during the annual Harry Potter Day. When the day first started, it consisted of board games and watching the first movie, which hit theatres in 2001. But since then, Harry Potter Day has gotten more and more intricate. It looks like a magical time.